Among the initiatives gathered in Paris was Just Security 2020, which builds on the Albright-Gambari Commission on Global Security, Justice and Governance and calls for a global leaders summit in September 2020, the 75th anniversary of the UN’s founding. The suggested summit offers a chance to contemplate the international system as a whole and its anchor, the UN. This gathering could adopt innovations to make the UN better prepared for current and future global challenges and more resilient amid America’s withdrawal from global leadership. For the summit to achieve meaningful changes, a new coalition of smart like-minded civil society groups and states is urgently needed. The UN 2020 Initiative has built a broad effort advocating for such a leaders summit. Through consultations, policy research and engaging government delegations, the coalition represents what is needed to ensure that UN reforms meet 21st-century challenges. Despite the initiative’s growing influence, in September last year, Russia and the Non-Aligned Movement (NAM) succeeded in removing from a new UN General Assembly Resolution, A/RES/72/313, language seeking preparations for the 75th anniversary with an eye to “further strengthen the Organization and improve its work.” Russia and NAM countries, such as Algeria, appear already concerned about a summit agenda that could run counter to their national interests. Rather than resign themselves to these near-term diplomatic setbacks, concerned civic groups and governments should be inspired by President Macron’s recent call, in his address to the General Assembly, to “rebuild multilateralism,” which he sees as a “challenge . . . for our generation.” In addition, German foreign minister Heiko Maas proclaimed that the United Nations thrives on the pledge of “Together First”, a slogan which is now the name of a civil society campaign launched at the Paris Peace Forum. What Are the Goals for 2020? To reverse the recent inroads made by populist and authoritarian forces worldwide, it is time for governments, scholars, activists and others to reiterate the need for multilateralism and to recognize the pursuit of justice and security as critical for achieving peace and prosperity. This approach is spelled out in our new book, Just Security in an Undergoverned World. Make key changes in UN Security Council membership and engagement. 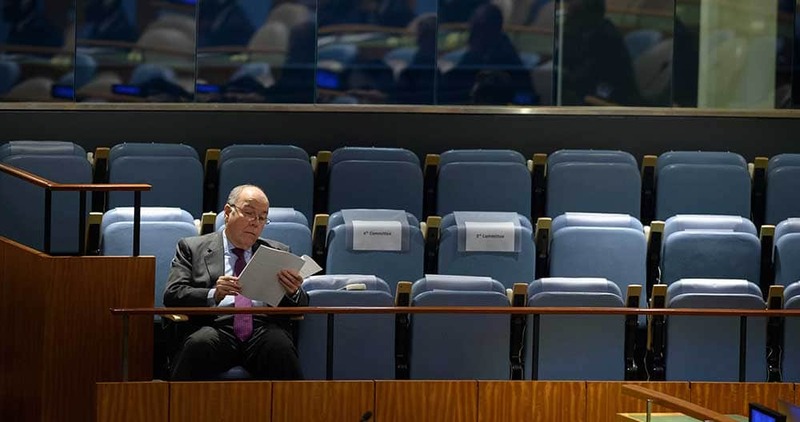 The UN’s approaching anniversary should encourage give and take, which could break the political logjam that has long hampered efforts to make the Council more effective and representative. For example, a small amendment to the UN Charter’s Article 23 could allow nonpermanent members (e.g., Germany and India) to be re-elected for consecutive terms. And the Council’s permanent-five members (Britain, China, France, Russia and the US) should again be encouraged to restrain — or at least to publicly justify — their use of the veto in cases of mass atrocities against civilians. Create a “G20+” as part of a new framework for global economic cooperation. Every two years at UN headquarters, the G20 forum should engage the other 173 member countries of the world body to ensure greater institutionalized coordination — with the World Bank, International Monetary Fund, World Trade Organization and others — and more prioritizing on crucial issues for the world economy. This new G20+ configuration could also strive to prevent the spread of cross-border financial shocks, promote the reduction of economic inequality and foster the inclusive growth that is necessary for achieving the Sustainable Development Goals by 2030. Establish a UN parliamentary network as an advisory body under UN Charter Article 22. The network would engage parliamentarians from their own legislatures to advise the General Assembly on UN governance, from reducing extreme poverty to nuclear nonproliferation. It would also complement other work to develop a transnational democratic culture, including the European Parliament’s recent recommendation to establish a UN parliamentary assembly. At the start of his tenure, in January 2017, UN Secretary-General António Guterres launched internal reviews on peace and security, development and management sectors, and in late July he appointed Jens Wandel, a veteran UN administrator, to carry out the reforms. While the reviews recommended long-overdue changes to the UN system, they are only the first wave of transformations to come. A new kind of smart coalition that taps the ideas, networks and abilities of diverse players must step up, alongside Guterres, to ensure that the UN’s 75th anniversary commemoration in two years becomes a turning point and not an anticlimax. Constructive criticisms of the UN from the right and the left should be heeded to weigh and adopt bold structural reform ideas. All this can help enable a modernized system of governance to better grapple with the crises now facing humankind. This piece was originally published at Passblue under a CC BY-ND 4.0 license. This version includes a few updates made by the authors. Richard Ponzio directs the Just Security 2020 program at the Stimson Center, in Washington, D.C. Joris Larik is assistant professor of comparative, EU and international Law at Leiden University and a senior researcher in the Just Security 2020 program. William Durch is a distinguished fellow in the Just Security 2020 program.